Edmontosaurus was probably the largest hadrosaur to live in Alberta and may have been one of the most abundant. It probably reached lengths of 15 meters (48 ft). Its uncrested, no nonsense skull was about the size of a horse's head. It had a high ridge back and may also have possessed balloonlike flaps, of facial skin, which may have inflated as the animal bellowed. Such flaps, perhaps brightly colored, may have functioned as sexual signals during mating season. Recent statistical surveys indicate that Edmontosaurus was particularly abundant in the damp lowlands near the shore of the inland sea. 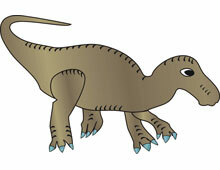 Edmontosaurus remains were first discovered in 1912 along the Red Deer River valley west of Munson.